Topics: Mission, Company Profile, Services, Contact Info, and Orders & Inquiries. 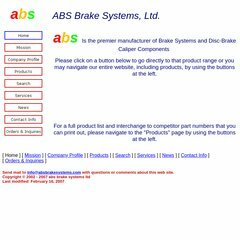 Absbrakesystems.com's server IP number is 199.237.205.250. ns19b.nameservers.net, and ns19a.nameservers.net are its DNS Nameservers. Ntt America Inc (Colorado, Centennial) is the location of the Apache/1 server. PING www. (199.237.205.250) 56(84) bytes of data. A ping speed test response, is timed at 50.2 ms.